Why a show about salt? Salt is everywhere - in our foods, on our roads, in thousands of the chemicals and consumer products we use every day. Despite this, salt is not something we notice very often. When not maligned as unhealthy, salt is typically overlooked. It is so pervasive in our daily lives that it is essentially invisible, something we take for granted without much thought. In this sense, salt is unremarkable. But its everyday-ness makes salt the perfect case study for the Rethinking MATTER project as we continue to explore the “material turn” in contemporary visual art. Simply put, the material turn represents a shift in focus from the conceptual to the physical, from words to things. This discourse (which spans a range of disciplines) often positions materials as enmeshed in sociopolitical histories and power structures. The ways in which we use objects can uphold (or disrupt) the status quo and reinforce (or trouble) our positions within that status quo. In this way, materials create us as much as we create them. But despite their power and consequence, everyday materials are easy to overlook. By exhibiting artists who either work with unusual materials or use traditional materials in unorthodox ways, we hope to not only explore the formal and aesthetic potential of such artistic experimentation, but to also bring the sociopolitical contexts in which matter operates into sharper focus. There is a growing number of artists who have taken up salt as their medium of choice. In our research for this exhibition, we spoke with Sigalit Landau (IL), who submerges everyday objects into the Dead Sea to encrust them in salt, and Ruth E. Lyons (IE), who carves sculptures from the rock of salt mines that trace the ancient Zechstein Sea from Ireland to Russia. We discovered Motoi Yamamoto’s (JP) sprawling labyrinths and Hannah Quinlivan’s (AU) otherworldly installations. Considered together, these works hint at salt’s complexity as a material that is steeped in history, linked with place, and loaded with meaning. Mark Kurlansky illustrates this complexity in his book, Salt: A World History. Tracing salt’s shifting and diverse roles across cultures over the past 5,000 years, he makes a compelling case that salt has, in many ways, defined civilization. It’s former status as the dominant means of food preservation (and the resulting global trade and related taxation), for example, positioned salt as a force that has driven economies, shaped landscapes, catalyzed wars and inspired political uprisings such as the French Revolution and the Indian War of Independence. Salt was powerful. Salt’s rich history became clear to us as we planned this exhibition. But we were originally inspired by the work of two artists who use salt in ways that reveal its aesthetic potential. 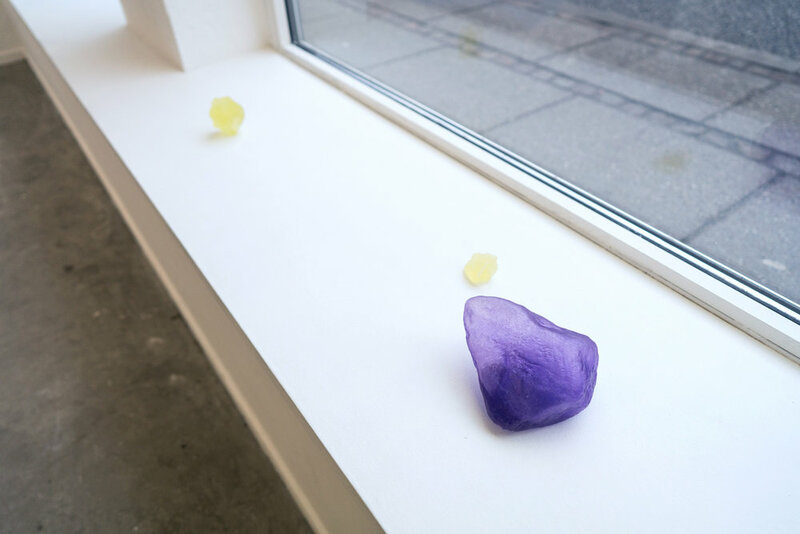 For Rethinking MATTER | Salt, we invited these artists - Nika Blasser (US) and Nat Bloch Gregersen (DK) - to create new salt-based works specifically for PLADS artspace. Nika Blasser uses hyper-saline water to create what she calls “salt-scapes.” Salt water leaves behind a granular residue as it dries, which allows the artist to build fields of salt crystals on the work surface, layer by layer. Blasser traveled to Aarhus for a three-week production residency in advance of the exhibition’s opening on January 5, 2018. While here, she experimented with new techniques and materials to adapt to Aarhus’ humid climate, which creates different conditions for the salt’s crystallization than her native Oregon. Perhaps influenced by the darkness of Nordic winter, Blasser created a series of 21 works on paper whose murky tones suggest geological forms. Nika Blasser, Salt Land, Salt Sea: Drømme fra vor Jord (detail). Photo by Minik Busk Langkjær. Nat Bloch Gregersen’s Iris is the latest in a series of installations featuring sculptural mounds of rock salt that trace the artist’s movements as she dropped the salt onto the gallery floor. Bloch Gregersen highlights the rough, gritty texture of this specific salt, which is typically used to de-ice winter roads, with coloured pigment, and mirrors this colour play with tinted window foil and rubber sculptures that filter the natural light and situate her sculptures within the specific architecture of the exhibition space. Nat Bloch Gregersen, Iris. Photo by Shu Yi. Nat Bloch Gregersen, Iris (detail). Photo by Minik Busk Langkjær. Nat Bloch Gregersen, Iris (detail). Photo by Shu Yi. By shining a spotlight on salt, we hope to have revealed it as remarkable - beautiful, responsive to artistic experimentation, and evocative of something bigger than itself. Rethinking MATTER | Salt. Photo by Minik Busk Langkjær.